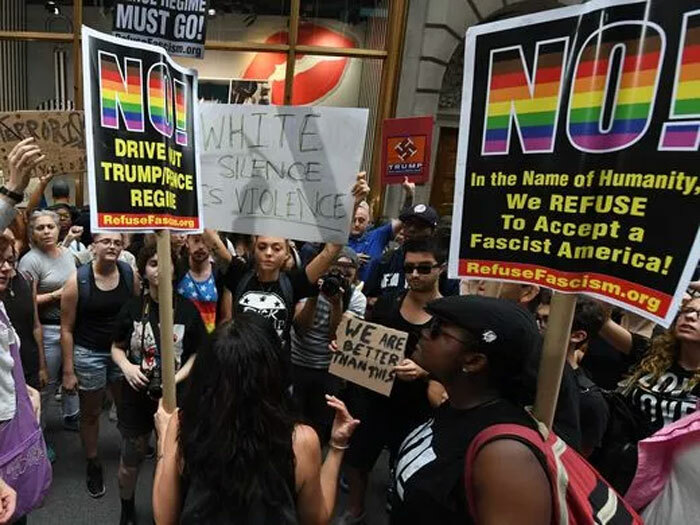 Protesters have taken to the streets of America since Saturday's demonstrations and violent actions by white nationalists. President Trump has felt the weight of backlash of the entire nation, even from his own political party and world leaders. What has been the aftermath of Charlottesville violent riots and how Trump’s statements continue to derail the President’s agenda, his public image, his ties with the Republican party and the country’s trust in their Commander in Chief? President Donald Trump announced the disbanding of two high-profile business advisory councils on Wednesday after several chief executives quit in protest over his remarks blaming weekend violence in Virginia not only on white nationalists but also on anti-racism activists who opposed them. A parade of prominent Republicans and U.S. ally Britain also rebuked Trump after his comments on Tuesday about the bloodshed in the college town of Charlottesville further enveloped his seven-month-old presidency in controversy, paralyzed his policy aims and left him increasingly isolated. Trump, a real estate magnate who had never before held public office, was elected president in November touting his experience in the business world and ability to strike deals. But some of the Republican president’s actions and words have alienated many corporate leaders. America’s closest allies condemned President Donald Trump in unusually strong and personal terms on Wednesday after he put part of the blame for violent clashes in the state of Virginia on those marching against gun-brandishing neo-Nazis. British Prime Minister Theresa May, widely criticized at home for cultivating close ties to Trump during his first half year in office, spoke out after the president repeated his view that the white nationalists and counter-protesters were both to blame. Minorities who came to the United States in search of a better life or who fought for equality were dispirited to see their fellow citizens fighting to preserve the legacy of the Confederacy and displaying Nazi symbols. And they said Trump’s response to the deadly violence only fanned racial flames. Trump’s initial statements on Saturday blamed violence on “many sides.” Two days later, he condemned white supremacists. On Tuesday, he lashed out at the counter-protesters who had been in Charlottesville. He also questioned whether removing public tributes to Confederate figures would result in similar treatment for statues of George Washington or Thomas Jefferson – both slave owners. His words are a sad reminder that the racist attitudes of the past have stubbornly persisted despite the progress of the past half century. One after another, the nation’s most powerful Republicans responded to President Donald Trump’s extraordinary remarks about white supremacists. Yet few mentioned the president. The Senate’s top Republican, Majority Leader Mitch McConnell, condemned “hate and bigotry.” House Speaker Paul Ryan charged that, “White supremacy is repulsive.” Neither criticized the president’s insistence that there were “very fine people on both sides” of a violent weekend clash between white supremacists and counterdemonstrators. The nuanced statements reflect the party establishment’s delicate dance. Few top Republican officeholders defended the president in the midst of an escalating political crisis. Yet they are unwilling to declare all-out war against Trump and risk alienating his loyalists. And as the 2018 elections begin to take shape, the debate over Trump’s words appears to be taking hold in GOP primaries. Trump’s overall approval rating may be dismal, but a small group of die-hard supporters is expected to play an outsized role in next year’s midterm elections when the Republican control of Congress is at stake. Those supporters are praising the president’s response to the violence in Charlottesville, Virginia, which left one dead and many more wounded. Republican leaders also need the president: They hope to work with him to enact meaningful legislation on infrastructure, taxes and health care to prove to voters their party can govern. The delicate relationship helps explain Wednesday’s cautious comments from powerful Republicans like McConnell. “We all have a responsibility to stand against hate and violence, wherever it raises its evil head,” McConnell said in a statement, noting that white supremacists are planning a rally in his home state of Kentucky. Virginia clashes brought attention to anti-fascist movement. The deadly white nationalist demonstration in Virginia has brought new attention to an anti-fascist movement whose black-clad, bandanna-wearing members have been a regular presence at protests around the country in the last year. Members of the “antifa” movement were among those protesting the Charlottesville rally last weekend. 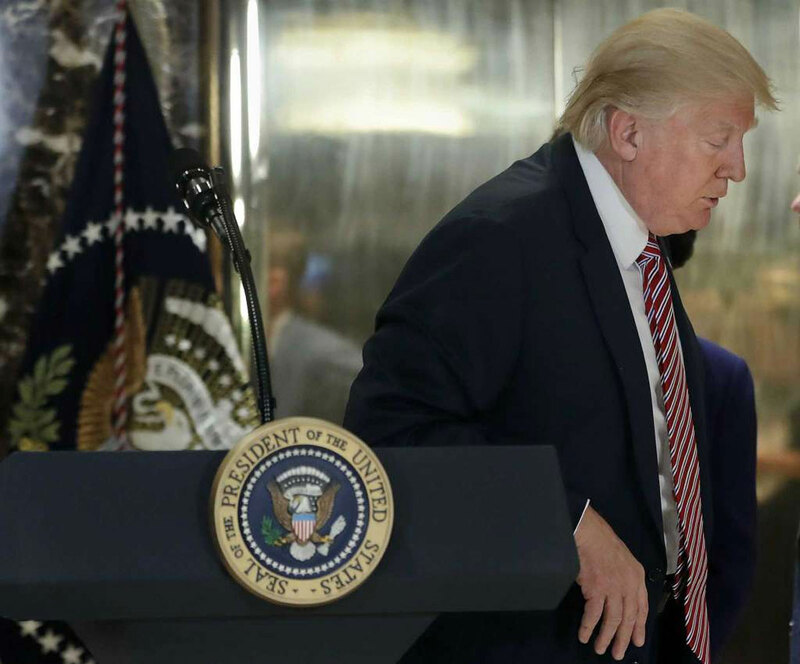 During a combative news conference Tuesday, President Donald Trump did not mention antifa by name but said there was blame “on both sides” for the violence. He said the counter-demonstrators charged at white nationalists with clubs and suggested they also had a hand in escalating the violence. “Antifa” is short for anti-fascists and emulates historic anti-fascist actors in Europe. It’s an umbrella term covering different groups that organize largely on the internet, said Mark Smith, political science professor at the University of Washington. According to websites and Facebook posts, people who affiliate with the term take a militant approach against fascism and white nationalism that doesn’t necessarily shy away from violence. 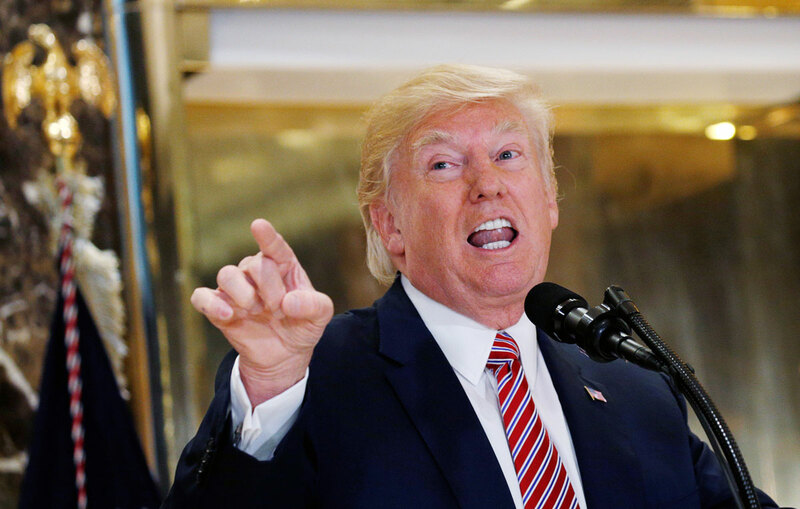 President Trump, a man of strong views, proves oddly ambivalent about white-supremacist violence and reverted to his true self Tuesday in telling the nation who was to blame for the Charlottesville riots on Saturday. His statements have left the country torn apart. Cities and states accelerated their plans to remove Confederate monuments from public property Tuesday as the violence over a Robert E. Lee statue in Charlottesville, Virginia, moved leaders across the country to plan to wipe away much of the remaining Old South imagery. Many local and state governments announced that they would remove statues and other imagery from public land, or consider doing so, in the aftermath of Saturday’s white nationalist rally. Many white nationalists have been praising President Trump after he doubled-down on blaming “both sides” in the deadly Charlottesville protests. These remarks were widely panned as an endorsement of white supremacy following the “Unite the Right” rally in Charlottesville, but were embraced by some racist hate groups. They also prompted David Duke to raise Donald Trump once again. Celebrities like Lady Gaga, Chris Evans (a.k.a. Captain America), Pete Wentz, Zendaya and more tweeted their horror about the ongoing events in Charlottesville. Other have joined protests all over the country. People from all different walks of life stand in solidarity in the aftermath of the violence and outright (alt right) hate. From high ranking politicians from both the Republican and Democratic parties, to citizens all across the country who took to the streets to protest, to various celebrities who took to social media, they all had one common message: white supremacy has no place in the United States of America. Aftermath of Charlottesville Violent Riots for President Trump: mistrust, rebukes by democrats, GOP, and world leaders. White supremacists on the rise.